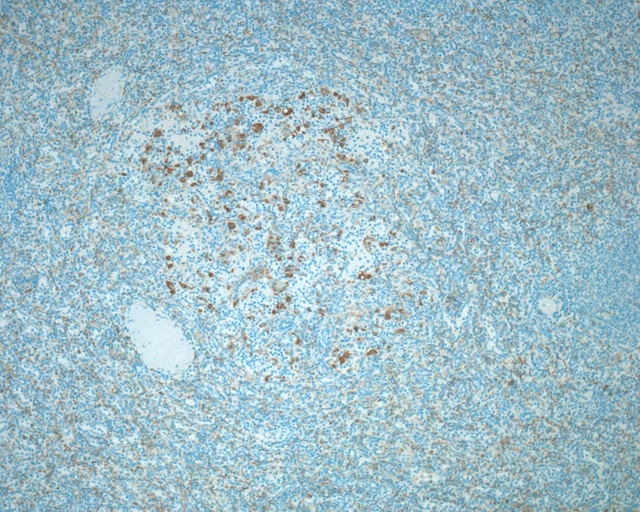 Thanks to Heide Facklam, University of Bern, Switzerland, for contributing this case. To contribute a Case of the Week, follow the guidelines on our Case of the Week page. 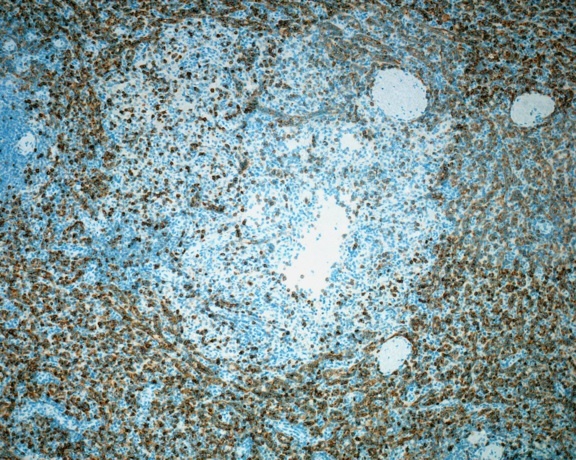 The Recurrence Score is calculated using RT-PCR technology to assess the expression of 21 genes in a patient�s FPET core biopsy or surgical excision sample.� The assay is precise, accurate, and highly reproducible over a wide dynamic range, with a success rate of >97%.� The assay is validated in 13 clinical studies involving more than 4000 patients. 1) In April 2010, we had daily average record traffic of 8,832 visits. Thanks for your support. 2) How can you tell what fellowship openings have recently been added? We now have a link on the main fellowships page (sorted by Specialty) at the top that you can click to find out. A 62 year old woman presented with sudden epigastric pain. �Her medical history included hypertension, nicotine abuse, pneumonia one year prior to admission and Psoriasis vulgaris treated with methotrexate until 2006.� She had no history of recent trauma. Physical examination revealed a tense abdomen, diffuse abdominal pain and a blood pressure of 91/63. �Laboratory tests showed decreased haemoglobin of 88 g/L, but her white blood cell and platelet counts were within normal limits. Ultrasound and CT scan (below) revealed rupture of a normally sized spleen. 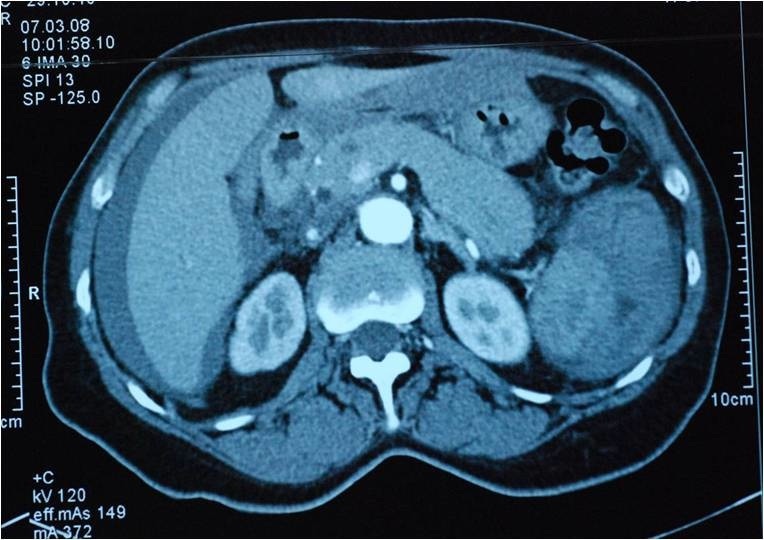 �CT scan demonstrated perisplenic hematoma and blood in the abdominal cavity.� At open splenectomy, approximately 3 liters of hematoma was removed. The resected spleen was normal weight and size (80 grams, 8x7x1.5 cm). The cut surface had multiple circumscribed, cystic, spongy, blood filled nodules ranging from 0.2 to 1.3 cm. Several foci were close or adjacent to the organ capsule. 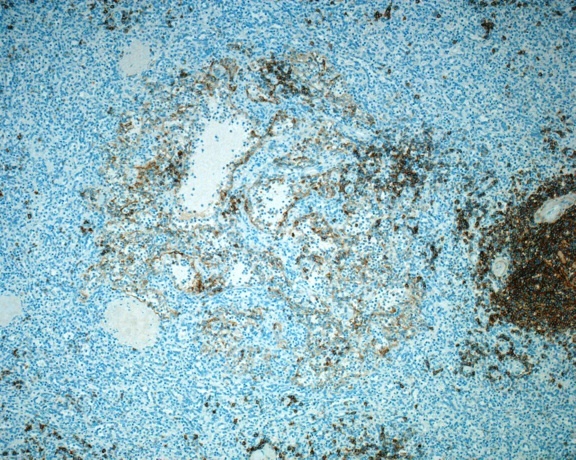 Microscopy showed tall lining cells with vesicular nuclei and small nucleoli, in addition to several exfoliated cells in the vascular spaces, and haemophagocytosis. �The cystic lesions correspond to a network of anastomosing, complex vascular spaces of varying diameter. �Papillary projections and cyst-like spaces were also demonstrated. �No atypia was present. 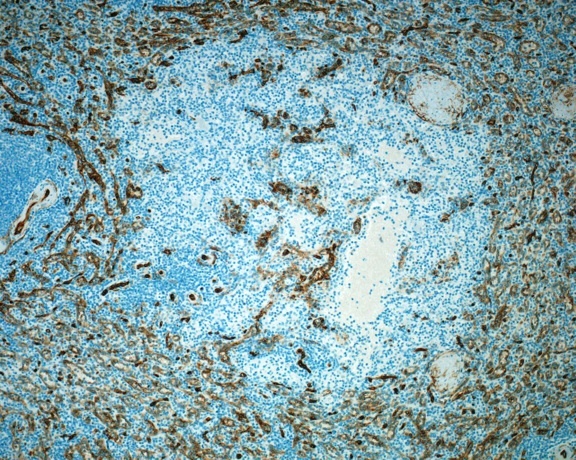 Immunohistochemical analysis showed positive staining of the lining cells with CD21, CD68 and CD31 (not shown), but negative staining for CD34 and CD8. 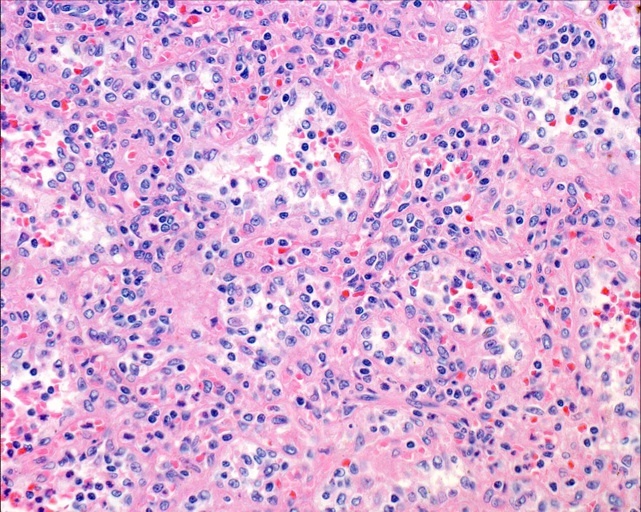 Littoral cell angioma is a rare tumor of the spleen, first described in 1991 (AJSP 1991;15:1023).� The tumor cells appear to derive from littoral cells, the specialized endothelial cells that line the splenic sinuses.� The littoral cells lie on a fenestrated basement membrane and are separated by tight junctional complexes.� They have an endothelial and histiocytic immunophenotype, and are negative for CD34, in contrast to conventional endothelial cells (Arch Pathol Lab Med 2004;128:1183). Splenectomy is usually curative. 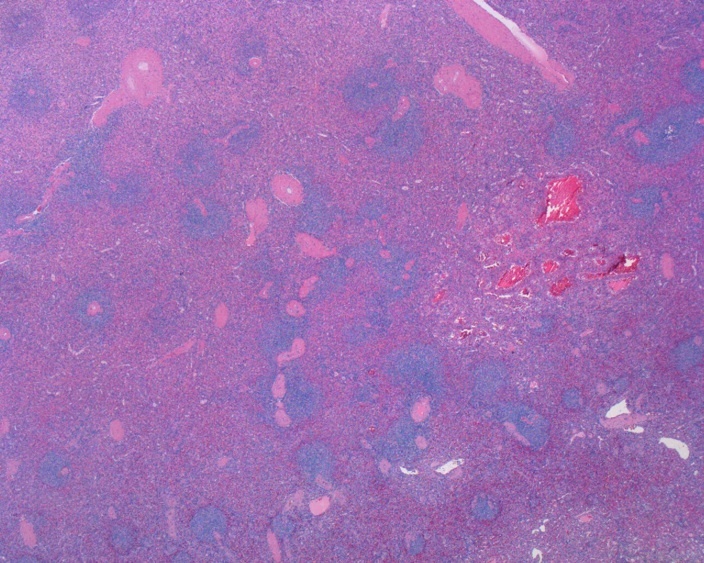 Littoral cell angioma typically has a benign clinical course, although exceptional cases with malignant behavior have been reported (Am J Surg Pathol 2006;30:1036).� �In this case, the patient has remained well at 10 months of follow-up.